First time poster, have read along over the years, some great posts and advice, awesome stuff. Hoping someone can help me out! I have a 2008 E92 M3. Very well looked after, 100,000km. Minor mods, BPM Stage 2 tune. I have owned this car for 3 years and 50,000km. All good. Replaced alternator a few months ago. Nothing else major to report. Recently a strange ticking noise appeared, sort of a clacky tick, different to the injector ticking and not deep knocking. Reading all the stories of rod bearing issues had me worried but it doesn't really sound like that type of problem. Sound is hard to replicate when stationary. Frequency in sync with RPM. Noticeable when driving near a wall or in a tunnel. I got underneath at idle with my head right at the oil pan, but nothing obvious coming from there. Sounds more like top end, but not 100% sure. I eventually suspected that perhaps it was the timing chain, and perhaps one of the tensioners was faulty or in need of replacement. I poked around the engine bay , and noticed through the oil filler cap (looking in there to see if the chain was loose) that there was something not quite right with the vanos unit on the RHS inlet camshaft. The cover/cap for that unit was bent/deformed/bulging at one point.... So, this must be the issue I thought. Off with the covers for a proper look. Turns out that the cover on that inlet camshaft adjuster unit (which I thought was metal but likely bakelite or similar) is sitting about 5-10 degrees rotated from where it should be, and the alignment tabs on its underside are now causing it to bulge out, because they are not resting in their corresponding slot. No evidence of anything external acting on this cover to cause this rotation. hard to tell what was underneath, but I assumed that something had acted internally within this adjuster unit to cause the cover to rotate. Could this be the source of my noise? Timing thrown out perhaps..? So, off came the unit (after buying the special tools for locking the camshafts etc), and I can't work out what has caused this. Took it to the local dealer to talk with a tech - he had never seen this and wasn't sure either. While I was there, I prised the cover off (it cracked in doing so), and we could see that the spring underneath looked fine, bolts in place etc. No apparent reason for the cover to be out of place, and the actual unit appears ok...?? Now, I the confusing part is that I pulled the LHS cam cover off and the LHS inlet camshaft Vanos adjuster unit has exactly the same issue. Same rotation of cover, same bulging!! WTF! The dealer wants almost $3000 each for these units. I know I can buy them cheaper from the US. But I am reluctant to just replace them because firstly the one that I pulled the cover off of (RHS) seems to be ok otherwise, and secondly, what if there is some underlying issue that has caused this to happen, and then the new ones do the same thing!! An expensive exercise. I have tried to attach some photos to show the parts, but I am having issues (perhaps as I just joined?). Will follow-up when I can with more pics to better describe. I cannot find much info on this "newer" vanos system, to determine how its operation may have caused these covers to rotate (they are very tight e.g. cannot rotate by hand, despite just "clipping" onto the steel lip around the perimeter, which I only discovered after cracking and removing the LHS cover). I have emailed BPM to see whether their tune may have caused some unusual advance/retard beyond factory limits, as all I can think of is that somehow the spring was "unwound" enough to contact the cover and pop the alignment tabs out of place..?! I could understand perhaps one unit having some random issue and the cover becoming out of whack, but to happen on both inlet units (LHS and RHS of the engine), exactly the same?! Surely, they were not installed at the factory like this!? Thoughts..? Any and all comments/advice would be much appreciated. Not sure why the covers rotated, but there's nothing tune related or internal to the vanos assembly that would cause it. The cap clips to the outer ring of the rotor housing, nothing else touches it. I suspect someone may have been in there previously who messed with them. There are rotors inside the vanos that limit the rotation of the vanos internals and the attached cam. If those rotors become damaged then you'll hear lots of strange clacking. That won't cause the cap to rotate and you'll often end up with vanos codes causing a check engine light, but not always. I say replace them and move on. Used ones can be purchased, however be very careful to buy them from a honest and reputable seller who can guarantee them as these engines are usually only dismantled due to bearing failures, and you DO NOT want the vanos units from those engines as the bearing material can migrate into the internal rotors and jams their movements. You won't know if the vanos unit is good or not until you fire up the engine and put a few miles on it. You don't want to go through all the work of installing a set of bad adjusters over the temptation to save a few bucks. Got a bad adjuster I can dismantle and look at? I don’t at the moment. However, I did recently take one apart and photo to document in an in depth forum post I have yet to get around to. Thanks deansbimmer, your response is very much appreciated! I think I will also replace the LHS with a new one (already have put a new one on the RHS). I was tempted to leave the LHS as-is, as if it is like the RHS was, there is nothing visibly wrong with the unit itself, other than the cap/cover being a bit skewed. BUT, I would hate for the cap to come off at some point down the road and send debris into who-knows-where! Will avoid a 2nd hand unit, as it's too big a job to get in there again, despite the price of a new unit being about $1200 USD vs 2nd hand about $300 USD. I won't take that risk with something so close to key mechanical elements that are deep inside the heart! Quick question re timing - I noticed that when checking the LHS bank timing, using the special camshaft locking tool as per the process in the manual, that the inlet camshaft seems ok (tool sits pretty much flush), but the exhaust camshaft leaves one side of the tool (the side between the 2 camshafts) about 2mm off its contact point. The allowable tolerance is specified as 1mm. Despite being the 3rd owner, I have no reason to believe that this has ever been msesed with... is it likely that it was always out slightly? Wouldn't the cam sensors + vanos system maintain specific (correct) advance/retard anyway? (I suppose that this might affect the extreme limit of advance/retard but nothing else (except perhaps the "neutral" position upon initial startup..? I will be resetting the timing anyway as part of the LHS vanos adjuster replacement, but still curious. "Not possible for a tune to cause this, as there are mechanical limitations of the vanos system, and even at the minimum and maximum limits a hardware conflict should not occur. The vanos changes we make are not in excess of positions that are commanded by factory software." Those VANOS caps can eventually fall into the engine, seems like because of the age and temperature. You can see results below, photos from my friend's car. He decided to go without them and removed remaining caps. Word of advice....DO NOT run the engine without the vanos caps in place. Those caps are the only thing retaining the return springs against the vanos. They WILL eventually come off if there's no cover. BPM is correct. There are mechanical limitations within the vanos adjuster that prevent the cams from exceeding their maximum advance/retard positions. Regarding your timing check... REMEMBER, you need to check bank one on #1 overlap TDC (cam letters facing down). If you don't then you'll get about 2mm of gap under the locking blocks. Remember that the whole checking process is started on cyl 1 power stroke TDC. Does your noise sound like mine? Start at the 25 second mark, sound is most audible around 27 seconds. It's like gear meshing or timing chain rubbing on the guide noise that comes and goes (not in rhythm) but is always there. I have had an indy BMW specialist and a BMW dealer both listen to it and they have nothing to say. I worry because I've never heard another S65 sound like mine. I have put a stethoscope all around the engine and the sound is most notable when putting the probe on the cross-hatch patterned area on the front of the driver-side cylinder head. My next step is to have deansbimmer take a listen when I have it in for rod bearings at some point. I think that VANOS caps playing role of dusters and "paper" for part number - nothing more. There's central screw which is holding spring in it's place and because of rectangle profile this spring will not bend easily in the direction to come off and there's no such force applied to it. So if it want to come off - it will, and cap will not save it or hold in place. Any bad experience with running VANOS without caps? I’m sorry but this assumption is simply incorrect. The central bolt does not hold the spring in place. It may cover one end of the spring but it does not retain it. It holds the center of the vanos hub (rotors) against the cam. The spring tensions the outer ring (rotor housing) of the vanos hub to prevent rattles under operation. There are pins on the other end of the spring that the spring nests in and tensions against but the cap keeps the spring coil from walking off the front of the vanos unit. Last edited by deansbimmer; 07-17-2018 at 09:28 PM. The washer and central screw definitely cover a few mm of the spring end, and it appears that this would be enough to keep it in place. The cover is relatively weak, as you know, and it appears that it is not actually pressing on the spring at all. Maybe it helps a bit, but difficult to say imo. I found a document with some good cutaway schematics and description of the vanos adjuster units, which help a lot (you've probably seen them, I will post when back at the PC). It says that the spring is used for "coordinating the adjustment time between the advance and retard adjustment." Sounds like it acts as a sort of dampener between the two opposite motions of the vanos (advance one way, retard the other). Dealer tech mentioned that it sets a home or central or neutral position, but it seems there is a separate locking pin for that, that seems to engage when there is no oil pressure. Seeing those schematics makes me think that the only way the covers/caps could have rotated might be due to some shock loading and inertia effects i.e. The rotor being activated and hitting hard against the housing, perhaps after the oil drains/leaks out of the units, and thus causing the covers to shift very slightly due to their inertia. This could be part of that cold start rattle issue that I've read so much about...? I'll post those schematics soon, they are extremely helpful in understanding how these adjusters work, and I couldn't find much detail at all via Google or the dealer, so really glad I stumbled across them! The spring returns the vanos to its starting endpoint. As you deduce it does also act as a buffer against pressure fluctuations and cam/lobe ramping and there is an internal plunger and check valve that engages the outer ring at low oil pressure to prevent erratic cam angles. 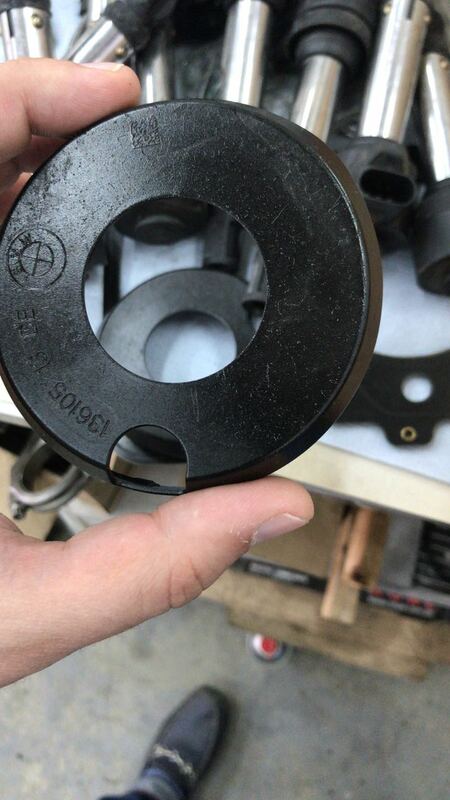 The main purpose of the spring is to assist/augment oil pressure for cam advancement as it advances the cam angles beyond the speed of the rotating engine (which requires more strength than retarding). Even a properly operating system will give some clatter at startup, that is normal. Clatter during operation and full oil pressure is not. I have seen all types of Vanos failures. I've seen the plastic caps pop off and the spring start walking off the front and start grinding on the front of the engine, as well as broken rotors. The broken rotor(s) will cause a racket during running and may or may not cause a check engine light. See pic. Interestingly, I see far more exhaust vanos failures than intake. I also sell more of them too. Dean is absolutely correct about this. 100 miles after I purchased my car it started leaking oil through a pinhole in the valve cover. Turned out that one of the VANOS covers fell apart which allowed the spring to come out and grind a hole in my valve cover and timing chain cover. My oil filter was full of metal from this damage (see pic). Even after the dealer replaced all 4 VANOS units, I still had issues with the oil level reading. The plastic remnants of the cover went into the oil pan and caused my oil level to consistently read low when it really wasn't. They ended up having to pull the oil pan to get the plastic out, same as seen in the pics posted above. Looking back on it, the previous owner probably knew something was wrong and took the car to a mechanic who likely discovered the damage and removed what was left of the plastic cover. He probably didn't want to pay for the actual VANOS replacement so decided to sell the car without disclosing this to me. Yes, do NOT run without those caps! See attached pics with the consequences. Last edited by Iyzmi; 07-18-2018 at 11:16 AM. Great photo evidence here. Were there any fault codes while this was occuring? Nope. The only thing that tipped me off was a low oil warning after a spirited drive and the resulting oil drops on my garage floor. I lost a little over a quart of oil through the valve cover hole. The car also ran fine and made no unusual noises. GREAT info and pics! Thank you! In 100% of cases if VANOS spring want to go off - it will remove cap too. But I'm not sure that in 100% of cases when caps go off - this will cause spring to go off too. 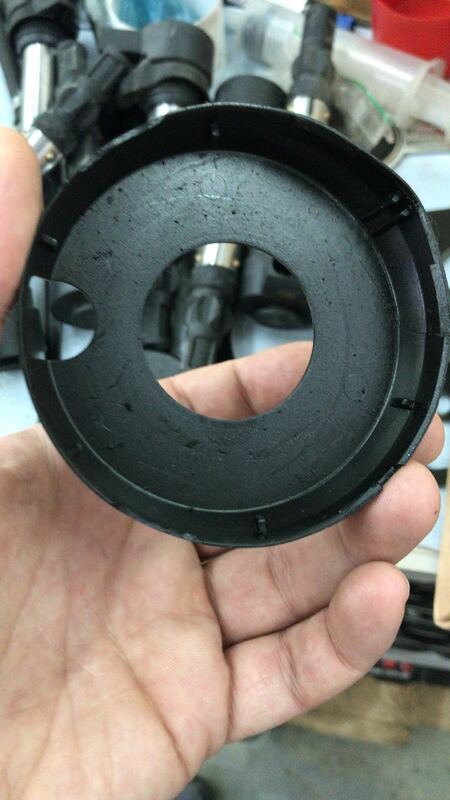 My friend was driving without cap for a pretty long time, maybe half a year and thousands of mileage, without any issues. Take a look at those caps from the other side, there's no any clips or anything which can hold it on the VANOS unit, seems like it can be removed by hand with really small force. The point is - fallen off caps are not the reason why spring go off too. Are you guys sure that such a thin piece of plastic can hold such a strong spring? If anyone have photos of this spring in expanded state, outside of VANOS unit? I can't imagine how it can be possible to drive car if spring goes out. Last edited by aptwave; 07-19-2018 at 07:10 AM. What is your claim based off of? Extensive first hand experience?? You don't have to feel certain, we will tell you for sure that the spring will EVENTUALLY come off. Good for him? He took a major risk and went against the BMW design and everything we know about the system (and common sense). Who's to say it wasn't going to fall apart after a few more days? Take a look at those caps from the other side, there's no any clips or anything which can hold it on the VANOS unit, seems like it can be removed by hand with really small force. This is incorrect, again. There are clips on the back of the cap that snap into the vanos housing. It takes considerable skill to remove an intact cover without braking it. These are not intended to be disassembled and BMW specifically states this. Are inspecting broken units and online pdf's your only vanos experience? The point is - fallen off caps are not the reason why spring go off too. In 100% of cases, springs coming off the hub ARE due to lost caps. The spring isn't forcing itself against the cover but it needs the cover to retain it from walking off the spring posts. If you set a vibrating shoulder massager on a table, it will walk all over the place. It is basically the same principle here. No significant force, but movement none the less. showing his vanos with the spring loose (no tension). He also said it ran fine. I will also confirm the engine will run without the spring, but was noisy in my experience (and it also ended up breaking the vanos internals seen in my pic above). I also explained the spring's function above. In case you didn't understand the gist, it wouldn't inhibit engine function if it were missing. Why is this even a discussion? BMW designed it that way for a reason which everyone here has confirmed was valid. If you are hell bent on risking damage or destruction of your engine by leaving the covers off, that's your decision but you're arguing uphill on this. Nobody is going to stop you but you're trying to convince yourself it's going to be OK when its actually going to be a major risk that most likely won't end well. Last edited by deansbimmer; 07-19-2018 at 07:23 AM. Yeah, post #7 is about my issue. I took the VANOS cap out through the oil filling hole at June 4th. It was already off VANOS unit, broken and rotating inside and making noise during cold start since September 2017. And after I took out broken cap I didnt hear this noise anymore. Both caps on bank #1 are gone at pieces and fell down in the oil pan. last week I took off VANOS caps from bank #2. BMW designed it that way for a reason which everyone here has confirmed was valid. BMW designed those plastic caps to dry off and go off at 100k miles and thus could damage engine. Isn't it seem strange? Why didn't they design better ways to fix springs at their places instead of weak plastic?